On Jan. 9, President Donald Trump delivered his first televised speech from the Oval Office. His speech was centralized on the Mexico border wall that Trump advertised during his presidential campaign, an effort he claimed would “Make America Great Again,” the central idea for his campaign. Trump’s speech emphasized crimes committed by illegal immigrants, such as murder and drug smuggling, explaining why the wall should be built. The government shut down on Dec. 22 due to disagreements between Republicans and Democrats on the border wall. Congress refused to give Trump the five billion dollars he requested to build the wall. The Washington Post reported that some cost estimates for the wall began at 25 billion dollars. According to TODAY, this has been the longest shutdown in American history. CBS reports that the now second longest government shutdown was 21 days long. That shutdown was during the Bill Clinton presidency from December of 1995 to January of 1996. According to Politifact, Obama shut down the government in 2013 to pass the Affordable Care Act. The Hill reported 56% of respondents disapprove of Trump’s border wall and TODAY reported that 53% of respondents are holding the GOP and Trump accountable for the shutdown. Trump’s supporters, however, have stayed loyal and are determined to get the wall built. Brian Kolfage, Trump supporter and Air Force veteran started a GoFundMe page for citizens to contribute to getting the wall built. 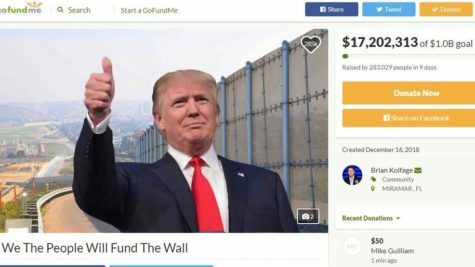 Kolfage also created a website, We Fund the Wall, where people can also donate to as well as sign a petition to get the wall built. Kolfage wants Trump to keep the promise he made to the American people during his presidential campaign. On Jan. 16, Speaker of the House, Nancy Pelosi, asked Trump to reschedule the State of the Union address until the government is back running. Trump responded by rescheduling Pelosi’s trip to Brussels, Egypt, and Afghanistan until the shutdown is over. Trump suggested she fly commercial to if she does not want to wait. On Jan 19., Trump offered a new DACA (Deferred Action for Childhood Arrivals) plan to democrats to end the shutdown. The plan includes three years of protection for DACA members. Pelosi declined his offer. “Unfortunately, initial reports make clear that his proposal is a compilation of several previously rejected initiatives, each of which is unacceptable and in total, do not represent a good faith effort to restore certainty to people’s lives,” Pelosi said, according to CNN. On Jan 25, the senate voted on two bills to end the government shutdown, one from each major party. Both bills failed to receive enough votes. On Jan 25, the government temporarily reopened. If Congress cannot negotiate a deal on immigration, the government will shut down once again, on Feb 15.